Parliamentary elections: necessary in times of war? Ukraine has seen the Maidan Revolution, the annexation of Crimea and now is trying to reform the corrupted system and simultaneously, win the war with Russia. In these difficult times President Poroshenko dissolved the Parliament and called elections for the 26th of October. What are the political reasons and possible consequences of elections during war? In times of war nobody wants to take painful but reasonable decisions, but everybody tries to win people's love and attention. And to achieve this politicians are ready to sow seeds of hatred. The current Ukrainian Parliament was elected in 2012. The elections were organized by a political group established and introduced to the political scene by former President Viktor Yanukovych. Therefore the old rules on elections were mostly favorable to his party – the Party of Regions. In 2007 the Parliament was elected by a proportional method, with a 3% threshold. After President Yanukovych implemented certain political reforms (giving himself as a President more political influence),the Parliament was elected by a semi-proportional election method in 2012, which meant that 50% of deputies were elected by voting on party lists (with a 5% threshold) and the other 50% as majority candidates. These election laws paired with abuses of the governing party left the Party of Regions with 187 out of 450 seats in Parliament. After the Communist Party joined them, President Yanukovych could govern with a strong coalition. With a parliamental majority and an increasingly dominant position of the President, parliamentary democracy was weakened and the power of the executive strengthened in the Ukraine. One of the democratic ideas of the Maidan movement was to turn away from the presidential system and come back to parliamentarism. So did the Ukrainian Parliament (Rada) after the events on Maidan: they voted against Yanukovych's reforms and re-established a parliamentarian system. But the Parliament did not pass a new election legislation and we can suppose that this lack of reform favoured again the executive. Now it is Petro Poroshenko, the new Ukrainian President, who would prefer this system, since it would grant him enough power to carry out reforms. According to the polls, the Presidential Party may achieve a strong majority thanks to the party list and majority candidates, and small parties will not have any access to Parliament with 5% barrier. In the end, the new President will be using the same “rules of the game” that Yanukovych did, which could again lead to the strengthening of the executive power. It is hard to stay objective and neutral in war time. Emotions are high, and we can see partiotism and social activism as developements, but at the same time the political scene was distorted by radicalization. People would like to stop the war but only a few want to compromise. Before the war it was hard to find examples of the “hate speech” in Ukraine, now we see thousands of pages of commentaries in social media, full of aggression and anger. The problem is that in times of war nobody wants to take good and reasonable decisions that would pay off on the longrun. Everybody wants to win people's love and attention. And to achieve this politicians are ready to sow seeds of hatred. Elections therefore look like a war between the candidates. It should be ackowledged that President Poroshenko and his team lead a good informational policy, without presenting aggressive goals, while trying to build dialogue and consensus across the country. At the same time the Radical Party's popularity soars with populist Oleg Lyashko expecting to get 9% of votes. For a system of meritocracy to be implemented the country would need a higher level of political culture and less emotional political discourse, which is almost impossible when society is going through such tragic moments. Elections are expensive procedures. 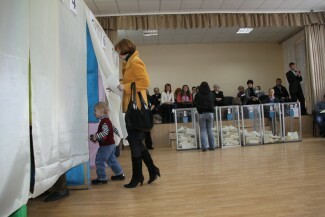 The State allocated more than 1 billion hryvna (about 1 million Euro) to the organization of the elections. More than 600 million hryvna (about 60 000 Euro) were spent by politicians on their election campaigns. In the state where soldiers don't have enough bulletproof vests and refugees from the East don't have anywhere to live, these sums seem absurd. Of course, Western countries and the World bank support Ukraine and without this support we could not imagine living conditions as they are now: with different social pensions, decent life conditions (on the territory under control of Ukraine, because there is a real humanitarian crisis on the territories which are under control of “Peoples Republics”). We of course needed elections, but the way in which they were organized seemed out of touch with reality. In the Donbass region, Ukraine cannot organize elections in 14 of 32 electoral districts. People who left the country or settled in others regions of Ukraine have the possibility to vote from distance, but it will not be easy for them either. It is impossible to organize Ukrainian elections in Donetsk (of about 1 million inhabitants before the war, city is now under control of armed separatists) and Luhansk (about 400 000 inhabitants), because “governours” of the city proclaimed those elections illegal. Annexed Crimea could not participate in elections either, the only way to vote for Crimeans is to go to the continent and vote there, because unfortunately we have not built an electronic system for Crimeans (2,2 million population, of whom 2% refused to accept the Russian citizenship, others became citizens of Russia “by default”). For these reasons the elections were complicated to organize, but despite all the obstacles they would be important and necessary to change the political elite. Our only hope is to organize fair elections with high turnout. Ukraine needed to restart the system after the Maidan Revolution, because people expected real changes, which were hard to implement with a Parliament which was elected in 2012 and with a majority of former President Viktor Yanukovych's party, the Party of Regions. Viktor Yanukovych, former Ukrainian President was himself defeated, but his party had remained in power in the Parliament with a strong majority. After losing their leader, some members of the Party of Regions left the party and joined other political forces. But with the remaining 41,56% of deputies from the Party of Regions, it was hard to pass bills which would have been important for reforms in Ukraine. Especially, it was hard to make the Parliament vote anti-corruption laws, lustration and energy reforms. In these conditions parliamentary elections were a must in the reforming process. One of the promises of Poroshenko's pre-election campaign was to purge the political scene. As he later pointed in one of his speeches, reelection was the best and the most efficient form of "lustration" of the Parliament as well as of political forces. The decision to hold the elections was done according to the Article 90 of the Constitution of Ukraine, where it is mentioned that “The President of Ukraine may dissolve the Verkhovna Rada (Parliament) of Ukraine prior to the expiration of term, if there is a failure to form within one month a coalition of parliamentary fractions in the Verkhovna Rada of Ukraine”. It is exactly what took place this summer. The parliamentary coalition was dissolved on July 24th and a new one wasn't formed within 30 days. As a result the President announced the reelections to be held on October 26th. This choice reflects people's acceptance and endorsement of the political regime and the decision-making process. The electorate's input in this process is giving the President votes during the presidential elections. This is also in conformity with the Constitutional process of the dissolution of the Verkhovna Rada of Ukraine prior to the expiration of it's term. While standing for the legitimacy of the October 26th Parliamentary elections, we have to admit that the country is undergoing an exceptional period. When there is war, there is no rule of a law. The question is how to hold elections, in conformity with all the laws, if these laws are breached every single moment? The first and most important thing, which to be done is to ensure that each and every citizen of the country can vote. This is one of the cornerstone of legitimate elections – to make sure, that every single citizen is able to express his/her opinion. At this stage the country's officials ensure this right to everyone, who expresses the desire to vote. All the citizens from the eastern part of Ukraine (where the war is taking place) are given the right and support to move to other regions of the country and to give their votes for the elections. Equally important is to ensure the right to be elected. Despite the fact that the Euromaidan rose against the political regime, people affiliated with that regime are still given the chance to participate in the election campaign, to be re-elected and represent their interest groups. This is the way how competitive elections are conducted, and this is an inalienable part of a legitimate election process. It is worth noting that the 2014 parliamentary elections are a unique event in the Ukrainian history. They are a result of the will of all citizens of Ukraine and a product of the current situation in the country. The Ukrainians have shown that they do not tolerate illegitimacy anymore and that the decision-making process can only be held is according to their own will.